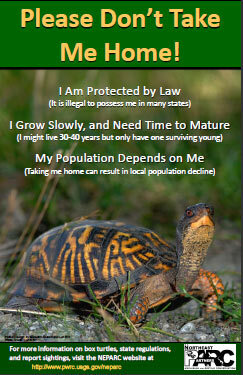 NEPARC has created poster, Please don’t take me home, to raise public awareness of box turtles and how taking individuals from the wild can negatively impact our wild turtle populations. Have you seen a box turtle? If so, please report it. NEPARC has created an educational post card, Don’t Take Him Home – Let Box Turtles Stay Wild, to raise public awareness of box turtles and how taking individuals from the wild can negatively impact our wild turtle populations. Northeastern US State Regulations for the Eastern Box Turtle – provides a summary of the native and non-native species reglulations for box turles including: personal use, commercial collection, release, and captive breeding. Includes contact information for each Northeast state. Rehabilitation Centers and Veterinarians that Treat Box Turtles – provides contact information for places that treat box turtles. Habitat Management Resources for Eastern Box Turtles – provides a list of informational resources on habitat mangement for box turtles. Box Turtle Education and Conservation Resources – highlights various education and conservation resources that are focused on box turtles. NEPARC has created a video, Box Turtles and Roads, to raise awareness of the risk roads pose to box turtles and how people might safely assist a turtle in need. Visit our parent organization, Partners in Amphibian and Reptile Conservation (PARC), for more information on national conservation efforts and other regional groups.This website and any products posted herein are officially recognized by the national entity, Partners in Amphibian and Reptile Conservation (PARC), as the efforts of an approved PARC Northeast chapter.